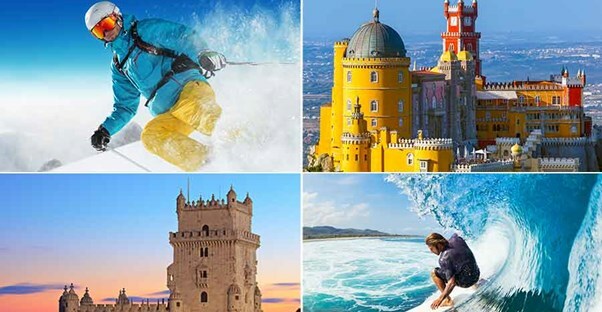 Portugal is a country that can fulfill your every vacation desire. Want to spend the whole day taking in the sun while watching surfers and listening to classic Portuguese music (known as "fado")? Portugal has got you covered! Want to trek a mountain? Bathe in a hot spring? Tour ancient castles? Ski (yes, even ski)? Portugal has it covered. Now the only hard part is going to be finding enough time to fit in as many experiences as you can into one trip. Coimbra is home to one of Europe’s oldest universities, as well as several other fascinating historical sites. This charming city, located by the Mondego River, is also home to beautiful gardens, fado music, stunning architecture, and a rich culture. You won’t want to miss the chance to learn about the fascinating history of not only Coimbra but Portugal as a whole. Seafood lovers and surfers from all across the globe flock to the small fishing village of Ericeira. Ericeira has been home to several world-renowned surfing competitions due to its optimal waves in the summer. Even if you don’t surf, you can still enjoy some of the freshest seafood at any of dozens of fabulous restaurants. If you want to embark on a thrilling island adventure or spend a day soaking away your worries in natural hot mineral springs, then the Azores is the place for you. The Archipelago (a group of islands) of Azores is composed of nine volcanic islands off the coast of Lisbon. The islands have everything from day spas to mountain climbing and are sure to captivate the interests of everyone who seeks them. Every cobblestone of this small Portugal town is seeping with history. Évora was once a flourishing city under Roman rule but is now the home to more than 4,000 historic structures. You won’t want to miss out on the endless learning opportunities and beautiful Gothic structures of Évora. Just off of the Atlantic Coast in Central Portugal, this beautiful, bustling town is known as “The Venice of Portugal.” Though the scenic canals, charming bridges, and colorful gondolas certainly do give off a very similar look to that of Italy, Aveiro is a whole different ball game. Aveiro offers its own unique historical sites, gorgeous beaches, and tasty cuisine. There is something for everyone in Aveiro, making this Portugal destination an unmatched experience—especially for those who love architecture and historic buildings. Portugal isn’t all beaches, you know. Serra da Estrela is Portugal’s largest protected area, the first national park to be created in Portugal, as well as the only ski course in the country. The unusual landscape of Serra da Estrela is due to its location between the spring of two rivers, which lead to an “alpine type” landscape with abounding in glaciation traces. But the best thing about this ski vacation is you’re only two hours away from several gorgeous beaches. Any wine connoisseur—or wine enthusiast—would love paying a visit to the world-famous port wine production city of Porto. This busy city, which cascades over the hills by the Douro River in northern Portugal, is home to “the pedestrian zone,” or Ribeira Square. Ribeira Square features several atmospheric places to look over the river, cafes buzzing with live music, restaurants, and more street vendors than you ever knew existed. Don’t miss your chance to go on some of the best wine tours of your life in Porto. For those travelers who are looking for a more unique experience, you can go to Alentejo to visit Capela dos Ossos or Chapel of Bones. Inside (and on) the walls of this 16th-century church are approximately 5,000 human skeletons. Though there are several other historic sites in Alentejo, Capela dos Ossos makes Alentejo the perfect Halloween destination. Madeira, or the “Floating Garden of the Atlantic,” is a fertile oasis in the Atlantic Ocean between Portugal and North Africa. This luscious island is home to the world’s largest concentration of laurel, historic churches, and the Lido Promenade. From the spectacular ocean views to the dense forest, you won’t know where to start on your amazing Madeira vacation. The Sintra is home to Pena’s Palace as well as several other historic sites. Pena’s Palace was built in the mid-1800s as a summer retreat for the Portuguese royal family. The palace is now one of several historic sites in Sintra and is surrounded by plentiful acres of parklands filled with exotic trees. Don’t miss your chance to explore Pena’s Palace as well as several other historic castles while in Sintra. This labyrinth of a city is known mostly for its intense fortification. The wall is no longer used as a means of defense but is kept as a historical symbol and attraction. Within the wall you can visit several quaint shops, busy squares, inviting cafes, and stay in the magnificent medieval castle. The castle is now a luxurious hotel, which features tours within the historic building. Who doesn’t want to be able to say that they got to stay in a castle? Algarve has everything you could ever want when it comes to a vacation experience. From breathtaking beach-covered coasts—where you can sit and bask in the sun for hours— to the stunning Renaissance monuments of Tavira. There is an unforgettable experience awaiting anyone who visits Algarve. Portugal’s capital and largest city is Lisbon. Lisbon stretches along the banks of the Tagus River, winds upward among seven steep hills, and forms an enchanting destination of warm weather, alluring alleys, quaint shops, Gothic cathedrals, impressive bridges, and colorful neighborhoods, reverberating in traditional fado music. Lisbon is the most iconic of Portugal vacation destinations for a good reason. Everything you could ever want to do is only minutes away in the gorgeous capital city of Portugal.